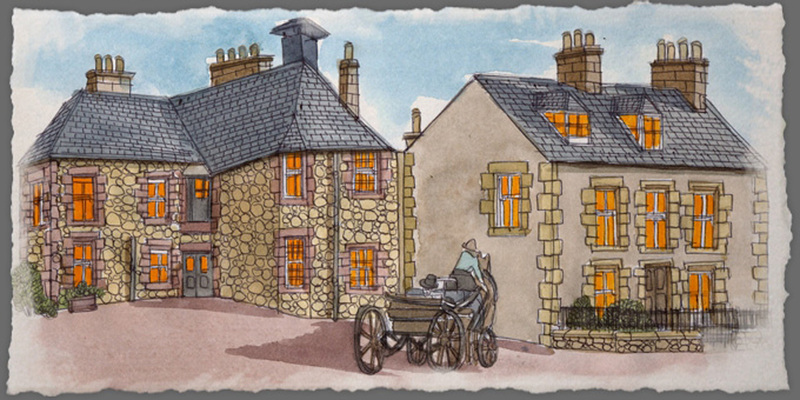 This distillery was situated in the centre of the old market town of Auchtermuchty in Fife. The earliest records of legal distillation indicate it was founded in 1829, although there is anecdotal evidence of the prior use of illegal stills in the area. The distillery was unusual in that it only ever had one owner – three successive generations of the Bonthrone family. The Bonthrone’s hailed from the area and according to whisky writer, Brian Townsend, were a “…true malting, brewing and distilling dynasty.” Ancestors of the family were brewers in nearby Falkland in the 1600’s. They also had local interests in baking and milling. Alexander Bonthrone (1798-1890) established the distillery in 1829, when he was 31 years old. He worked the stills for the next six decades – almost until his death in 1890 – making him one of Scotland’s oldest distillers. In addition to his chosen profession, he held several civic titles. Bonthrone was at various times a Baillie to the burgh magistrate, Justice of the Peace, and a Municipal Councillor for Auchtermuchty. He sat on school boards, and church committees. A committed Liberal, he advised Herbert Asquith, the local Member of Parliament on whisky industry matters. Asquith later rose to become Prime Minister from 1908 to 1916 and curiously stood firmly against Lloyd George’s proposal to introduce Prohibition in Britain. Alexander’s younger brother, John Bonthrone (1799-1881), was described as “…pioneer of the malt trade” and was one of the first commercial maltsters in Scotland. With an eye on commercial opportunities of industrial-scale maltings, he was instrumental in the construction of Fife and Kinross Railway, with the station opening at Auchtermuchty in 1857. His commitment to railway expansion as a means of expanding his own business interests, led him to invest in the City of Glasgow Bank, which famously collapsed with debts of six million pounds in 1878. The shock of this incident, and loss of reputation was said to have contributed to his declining health and death three years later. Alexander Bonthrone outside his home in Auchtermuchty. By Adrian B McMurchie. Both Alexander and John’s sons joined the business – John Bonthrone (John jnr) ran commercial maltings in _Newton of Falkland, Pitlessie, Perth, Ladybank _and St Monans_. Alexander’s_ sons John and William assisted him at the distillery – one of them is recorded as guiding Alfred Barnard round the distillery on his visit in 1887. The water then flowed via a specially constructed aqueduct to the distillery and down a man-made channel that, even today, effectively splits the town in two. Construction of the distillery was an arduous affair. The water source is a tributary of the Eden, channelled from the “Lovers pool” via an aqueduct and down past the distillery buildings in Burnside Street. This feat of construction took two years to complete. To route the stream through the town, 3000 cart loads of solid rock were blasted and hewn out, and then used to construct the walls of the lade. The distillery buildings themselves – the mill, the mash-house and the still-house, were all in a line down one side of Burnside St, adjacent to the re-directed stream. Each of these buildings was powered via a series of three water wheels. Barnard noted in admiration, there being “…no other motive power in the distillery.” A bonded warehouse was built, in the aptly named Distillery Street. In the early years of Stratheden’s life, Bere barley or “Bygg” would have been the preferred strain of barley. This type is _ »six-row barley » _as opposed to the two rows of modern strains. It was relatively low-yielding, and produced grain of inconsistent size, therefore achieving a consistent level of sugars in malting remained a challenge. It remained the barley of choice until the late 1940’s, when two-row barley favoured by modern farmers became available. This modern strain produced a more full bodied, maltier style of barley, with higher yields and better tolerance to Scotland’s climate. Yeast cultures were harvested and re- used from the residue of washbacks after fermentation, although they were prone to contamination with bacteria and wild yeasts. Porter yeast (or brewer’s yeast) was preferred as it tolerated high worts gravity and temperature fluctuations. It also contributed to a heavier style of spirit. Commercial yeast was available from the 1870’s, with the Distillers Company Limited (DCL) building a yeast house at Cameronbridge Distillery. Given the proximity to Auchtermuchty, and the Bonthrone family’s long experience in baking and brewing, they were better placed than most to develop consistent yeast cultures. Barnard noted that peat was brought from Orkney to kiln the barley and to fire the tuns and stills. This was a reciprocal trade agreement via the recipients of John Bonthrone’s malting business – Orkney peats being preferred to local peats available on the Lomond Hills. Orkney peats had a pronounced briny or medicinal note as it contained decomposed seaweed. These peats would contribute the particularly strong “peat reek” of Stratheden whisky, which in turn contributed to the robust nature of the spirit. Alexander Bonthrone arriving at Stratheden Distillery. By Adrian B McMurchie. The mash tun is recorded by Barnard as being a copper vessel of 2000 gallons capacity for heating water, and a wooden tun 11 feet in diameter and 4 1⁄2 feet deep. Viewed in 1887, this part of the process has clearly not evolved from earlier in the century. The water seems to have been the star ingredient, with the water source described as “…splendid water, and as pure and sparkling as crystal.” The source of the Eden is next to the hamlet of Burnside, to the north-west of the Lomond Hills. The water is extremely soft, with a distinct earthy and salty edge to it. This would add a mild saline character to the whisky, suggesting more of a coastal style of spirit rather than a typical lowlander. Barnard reported that the stills were unusually small compared to the scale of the other parts of the process. The wash still and spirit still were 960 and 460 gallons respectively. The latter still purchased from a smuggler 60 years prior, meaning that this was the original still installed on opening in 1829. Alexander Bonthrone noted that he would not exchange his old stills for fifty newer versions twice the capacity, and he attributed the quality of the whisky to the water, and these small, old stills. Whisky distilled in the early 19th century was generally not aged. 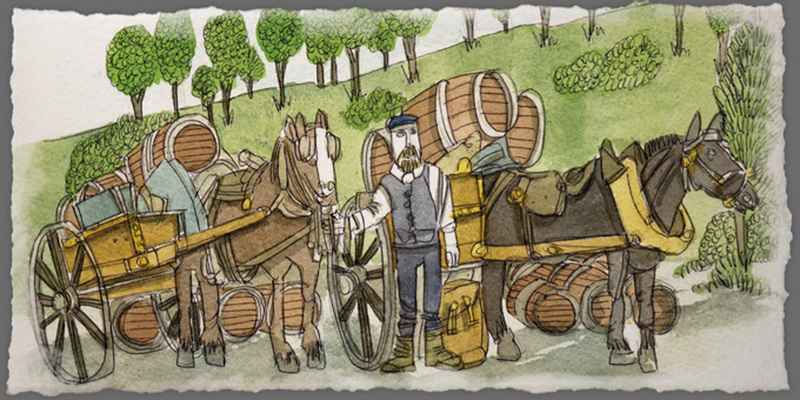 Duty in Lowland distilleries was paid on proof gallons produced – there was no incentive to watch it mature and evaporate. Bonthrone junior (John or David) noted in 1887 that five merchants took everything they could produce – clearly the distinctive spirit produced at Stratheden was high quality. The whisky produced at Stratheden had a pronounced sherry influence in it. The distillery bonded warehouse records illustrate this – in December 1924 the bond in Auchtermuchty contained 475 hogsheads and 131 butts. This inventory was drawn up prior to the sale of the spirit in bond to Arthur Bell and Sons. Reading the document it seems that Stratheden closed in December 1916 in line with all other distilleries, and did not produce again until 1922. Alexander Bonthrone died in 1890 – his sons took up the reins of running the distillery. Unfortunately they did not get on, and John Bonthrone largely left the running of the business to his brother William. The early years of the 20th century were challenging for all distillers. The Liberal Government of 1908 was elected on a mandate for social reform, and was determined to drive down alcohol consumption at home. Duty was increased in the “People’s Budget” in 1909. During World War One the government drafted a proposal to introduce Prohibition. As Minister for Munitions, Lloyd George deplored drunkenness in the wartime workplace and considered alcohol consumption a greater threat to Britain than Imperial Germany’s U-boats. As a compromise measure, compulsory bonding of three years was brought in by the Wine & Spirit Association (the fore- runner to the Scotch Whisky Association) and all distilleries were closed from December 1916. In 1918 duty increased again, from 14/9 to 30 shillings on a gallon. In April 1919, it reached 50 shillings a gallon. In 1920 a further steep tax increase was introduced – this was restricted to the distilling industry, who were forbidden from passing this onto their customers. Britain entered an economic recession in late 1920, and the economy remained stagnant throughout the decade. Within the whisky industry, global sales in 1920 were only half the level enjoyed in 1900. Exports plummeted from 1,856,000 gallons in 1924 to 1,056,000 by 1928. In 1925 there were 124 distilleries working, but by 1929, that number had dropped to just 84. Alfred Barnard noted that the distillery was a curious mixture of the modern and traditional – the ingenious harnessing of the water and the somewhat outdated use of water wheels to power the plant. The Bonthrone’s were not slow in exerting influence for commercial gain, yet they knew the value of using traditional, small batch pot stills. Whilst they maintained tradition in the distillery, they were quick to position themselves when the railway line opened in the town. The challenges of the early 20th Century proved to be too much for Stratheden, William’s two sons ran the distillery after his death in 1919, although demand was so poor that they did not re-commence production until 1922. Successive duty increases, set alongside distilling costs that were higher than those of modern distilleries meant that margins were eroded to the point where there was little will in continuing. The final blow was the loss of its major export market, as the United States embarked on a decade of Prohibition from 1920. The distillery ceased production in late 1924, and closed for good in 1926. The maltings remained in use until the 1970’s. The bonded warehouses were bought by Arthur Bell in 1931 and remained in use with United Distillers until 1989. The old bonded warehouses still exist to this day in Distillery Street. Although now derelict, it cannot be knocked down due to its status as a listed building. The warehouse doors can still be seen to this day and clearly mark that it was a bonded warehouse. The colour that we have chosen for our label for Stratheden matches the colours of those warehouse doors as they are today. Article brought to you by The Lost Distillery Company archive team. All rights reserved.